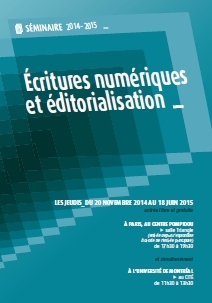 Created at the INHA in 2009, the Sens public seminar, supported by the MSH Paris-Nord, displays new practices of editorialization and questions the principles, advantages and limits of the evolutions of digital editorialization. Today, the seminar is organized by the IRI, the University of Montreal and Sens Public. It takes place in duplex between Paris and Montreal, with crossed lectures on either side of the Atlantic. The sessions take place each month in Paris in the “Salle Triangle” near the Centre Pompidou from 5:30 pm to 7:30 pm, and in Montreal from 11:30 am to 1:30 pm in the University of Montreal. The entrance is free on registration. Officiel website of the seminar on Sens-public.org. Editorialization is a complex process resulting from interactions between contents (or resources), a technical environment (networks, servers, platforms, CMS, algorithms of the search engines), structures and formats (hypertext, multimedia, metadata) and practices (annotation, comments, recommendations via social networks). This digital contents process of organization is inherently open and dynamic. Thursday, November 20, 2014: opening session. Between blog and scholar review: hybridization of research practices. By multiplying the forms of reading and writing in non-scholar society, the digital has furthered the emergence of new practices mixing communication, collection, archiving, literature, etc. In the context of a fluidizing of the forms of writing, the researchers’ practices are also diversified, often borrowing some forms of production of content hitherto absent of research methodologies. This hybridization of practices we have recently witnessed seems to open research and researchers’ community to new forms of production of knowledge, which upset the classical process of legitimation and certification of knowledge. – Celya Gruson-Daniel : Co-founder of the association HackYourPhD, and research engineer in charge of the MOOCs at the Center Virchow-Villermé. The access to resources and knowledge was, originally, essentially based on university or personal libraries. It is probably the aspect of research which is most benefiting from the hybridization and opening of practices allowed by the digital. The multiplication of non-scholar contents and their integration into research practices have thus authorized a larger fluidity in the circulation of ideas and, potentially, a greater creativity. This enlargement of sources has for example opened new opportunities to the construction of research hypotheses. However, it is worth asking whether or not these non-scholar resources allow maintaining the qualitative level required by the scientific community, and whether researchers have adopted new strategies of validation to certify these sources. Taking a look at the emergent practices of watch and access to knowledge, this session will raise the question of the researchers’ evaluation and legitimation of resources. This session will exceptionally take place at the University Paris Ouest La Défense, to close the symposium on scholar reading devices. A decade of public policy of digitalization has allowed institutions to rethink the access to their corpuses. To respond to the gap between traditional practices, stabilized in libraries, and digital practices of access to the resources, national and transnational projects such as Gallica, Europeana or Canadiana have indeed conducted many studies on the modes of structuration, making available and circulation of archives. These recent digital archives have naturally been adopted by the researchers’ uses and works. Today, it is possible to measure the impact of these digitalizations and archiving formats, which sometimes have fit into the very structure of archives some explicit assumptions about the conceptualization of heritage. In addition to the format of data, the archives editorialization devices deeply determine the accessibility to resources and eventually the researcher’s work. We will try, relying on several concrete examples, to explore these tensions between the resource and its appropriation, as well as the researchers’ strategies to circumvent or ignore the archives formatting modes. The community of peers remains a pillar in research, especially for the assessment of publications. However, we observe an all-round enlargement of these communities of peers, following the researchers’ new and more open practices of publication, of which the editorialization incorporates modes of sharing and discussing coming from non-scholar environments. These editorialization devices redefine the conditions of parity by opening scientific controversy to larger communities, thus encouraging their access to the public and furthering a greater transparency on research issues. The public’s collaboration to these controversies, or to micro-tasks of research through the initiatives of Open Science, fully participates to the scientific activity. One may wonder to what extent these communities compete with or call into question the established institutions and communities of peers, and if this new diversity will prove to be a wealth and a progress for sciences, giving back a political and ethical anchorage to the researchers. The web seems to question deeply the concept of author as it has been known since a few centuries. The integration of copy and paste into usual writing, and more generally the new forms of editorialization, put forward the collaborative work and tend to weaken the meaning of signature. Reception of content is thus more linked to its broadcasting platform than to the person who created it. Expressions such as “I found this information on Google” or “on the web” reveal a change in the perception of the content legitimation devices. In the same way, the researchers themselves integrate logics of sharing and co-elaboration of results which do not promote the achieving of an own work, potentially highlighted as such by an individual. The researcher rather introduces and defines himself through the aggregation of his activities, participations and collaborations, often published or communicated as a work-in-progress escaping scientific validation. In this context, what about the concept of work conceived as an individual’s – or a group of researchers’ – coherent production? How to think the notions of “plagiarism”, “replica” or “originality”? What are the new vectors of recognition allowing despite everything to make a work (“faire oeuvre”)? This session, in the form of a workshop, will revisit the topics and questions that have been dealt with during the previous five sessions, to re-interrogate their issues and try to bring out some trends and elements of answers. An editorialization, as a device of shaping and structuration of content, is not limited to a close and delimitated context (e.g. a review), nor to a predefined group of actors (publishers). On the contrary, it implies an opening in terms of space (multiplicity of platforms) and time (several actors on multiple temporalities). This opening is one of the main differences between edition and editorialization. If edition, as it has been known from the 18th century to nowadays, has been the main device of production and organization of knowledge, now its function is progressively upset and renewed by editorialization, which deeply transforms the modes of circulation and appropriation of ideas. In this context: what becomes the activity of research – which has precisely based its regime of truth on edition and publication? How do digital practices modify research – the activity of production of knowledge par excellence? This is the question the seminar of this year will try to answer, through a reflection of the different aspects of research – including in the field of human and social sciences – impacted by the new forms of editorialization. We propose an analysis of these new models of research, starting from the forms of publication that have emerged since the birth of the web – such as blogs –, passing by the researchers’practices of watch and collection of information, the questions of archiving and the problem of the content legitimation. The seminar is carried out in collaboration by the review Sens Public, the IRI and the University of Montreal, supported by the MSH Paris-Nord. It has been created in 2009 in partnership with the laboratory Invisu (INHA- CNRS). Each session gathers between two and four lecturers, in duplex in Paris and Montreal. The sessions take place on November 20, 2014, January 22, February 12, March 12, April 16 and June 18, 2015, in videoconference between the University of Montreal and the Salle Triangle of the Centre Pompidou in Paris. All video archives are available on the platform Polemictweet.com.